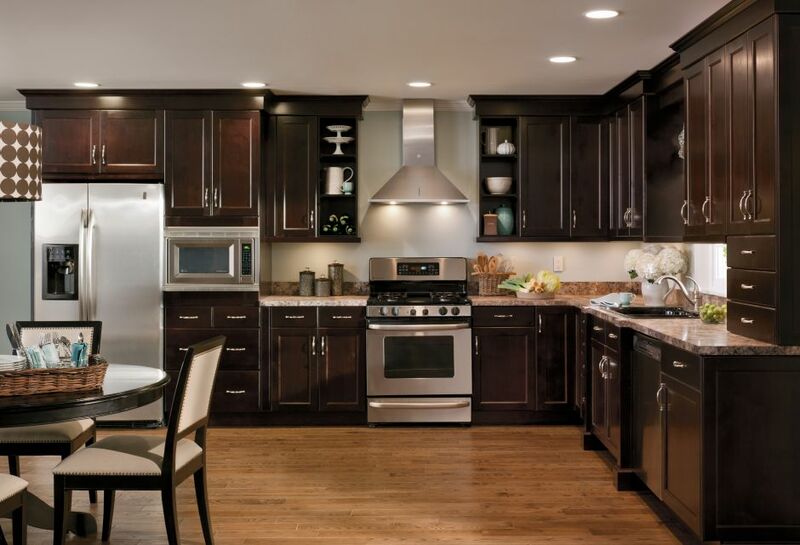 Our Kitchen Design team has the expertise to make your vision come to life. Whether you are starting a kitchen remodel or planning a kitchen for your new home, we are equipped with the design talent, the latest products and brands, and the services to give you the kitchen of your dreams. We know that kitchen design is not just about taking measurements and filling your space with cabinetry and appliances. Our kitchen designers will spend time discussing your needs and wants, and how you and your family ‘function’ to create an elegant layout that perfectly complements your lifestyle, taste and budget. We believe a successful kitchen design and installation starts with the right ingredients. That’s why we provide complimentary planning consultations with our knowledgeable professional designers, free site measurements, detailed final design presentation and estimates, delivered by Woodhaven’s fleet of trucks, installation by our in-house craftsmen, personalized attention to detail, and full cabinet manufacturers’ warranties. Need a visual to guide your vision? Visit one of our convenient showrooms. We have over 10,000 square feet of Kitchen & Flooring Showroom space, featuring the latest in cabinetry, countertops and flooring for kitchens, baths, laundry rooms, mud rooms, home offices or entertainment centers and wet and/or dry bars. Denise Bates has a love of learning and working with great people: from homeowners to contractors to other design professionals. By keeping an open mind and with an eye towards learning as much as she can every day, Denise has brought immeasurable value to her clients in the 20 years that she has been designing. Denise makes it a point to make each project a learning experience - whether its taking a client’s unique taste or a space challenge - and applying those lessons to her next project. This formula has made for many clients with fond memories of working with her. Jennifer Breese started her design career at a custom cabinetry shop…in accounting. Realizing her eyes were more interested in color palettes, than numbers, she set about learning everything she could about design. From initial sketching to building to installation, Jennifer observed first-hand all that is involved in a design project. Moreover, she closely watched how her colleagues worked with clients to find her own collaboration style. Jennifer starts by taking careful stock of her client’s needs - where and how they live; how often they cook; how they shop - in bulk or day-to-day; how many children; how they like to entertain; style preferences and budget - and then creates a solution to fit those requirements and dazzle the eye. The very first meeting with a client on a design project is Yasmin Deren’s favorite…other than getting to see the clients’ reaction at the completion of the project, of course. But, It’s that initial discussion when ideas are swirling and concepts are starting to form and those core ‘ingredients’ of what a client really needs and wants are revealed that really inspires Yasmin. Whether big or small, grand or simple, Yasmin loves the opportunity to create a well-thought, functional and stylish kitchen or bath or laundry to make the client go ‘wow!’. A life-long career in design was pretty much a given for CaroleAnn, who grew up in a construction family and whose favorite smell is that of freshly cut wood. Cultivating an admiration for beautiful homes from a young age, CaroleAnn is a design natural. She finds the best source of inspiration is right from the hearts and minds of her clients…and the sometimes ‘hundreds’ of pictures they bring in. With a knack for finding and articulating the connective thread of her clients words, and those pictures - often times in seconds - is what makes CaroleAnn unique and beloved by her clients. It’s not surprising that her favorite part of any project is the hug at the end. Hearing “I need a new kitchen” is music to Richard Gurtler’s ears! When this musician is not performing at a local club, he’s funnels his creativity into designing. Rich has a particular passion for combining ergonomics with style and aesthetic. His ability to achieve that perfect balance of elegant form and efficient function in a room is what Rich’s clients love about his designs. The first step: defining with a client what is and isn’t working in the current space and a budget. From there, Rich takes inspiration from a variety of sources to create a unique ‘perfect interior’ for each individual client. With that type of personal attention paid, it’s no wonder his design chops are so appreciated by his clients. As a designer for almost 30 years, Rob McGregor has pretty much seen and done it all when it comes to design, from grand, exquisite kitchens to basement ‘man caves’. One of his favorite parts of the process is asking, ‘if you could have anything, what would you want?’, and then creating a solution that meets the client’s taste, style and budget. Rob finds his inspiration in listening closely to what the client imagines for their project blended with the personal stories they share about how they live and function. Clients have commented that it is his patient and diplomatic approach that made all the difference in making their vision a reality. You could say designing has always been second nature for Evamarie. From ‘surprising’ her mother more than once with a re-arranged living or family room to playing a significant role in designing their family’s kitchen at a young age, Eva has a knack for knowing what works and what doesn’t. It’s that kind of instinct, along with her her ability to remove the stress and bring out the fun of a design project, that endears Eva to her clients. To Eva, the most important aspect of any design project is gaining the client’s trust by demonstrating her sincere care for the client and what’s in the best interest of their unique project. Melody Ann Wells has been involved with different aspects of the construction and renovation industry since her teens. She was a partner in a plumbing business as well as had her own remodeling company for a time, overseeing all job aspects from start to finish. But, her passion for, and desire to focus on, drawing and design eventually won out, making for some very happy clients who have had the opportunity to work with her. Melody loves to push the envelope creatively with her clients, and more so, loves to see the smiles on their faces at the end of a design project. Browse through these beautiful kitchen and bath photos that will spark your new ideas. Want to talk about Kitchen Design & Installation? "We will continue to brag about Woodhaven - for anyone who wants the job done right on the first try. You are the best!"